Look no further than Surround™ Housewrap, a TEKTON® Brand, and Surround™ SR Roofing Underlayment, a TEKTON® Brand, to help protect your home. Both are made by the manufacturers of proven TEKTON® weather-resistant barriers. Tear strength—when installed properly, Surround Housewrap offers excellent tear strength to keep the barrier intact and your wall cavities dry. Water holdout—helps keep moisture from entering your walls during construction and after exterior cladding is up. Moisture Vapour Transmission—allows moisture to escape, reducing the risk of mold and mildew. A non-perforated, nonwoven product, Surround Housewrap protects your homes, and your reputation, from being damaged. Start at the top with Surround™ SR Underlayment, a TEKTON® brand. The roofing deck is the area that supports the actual roofing material, and protecting it from moisture is key to assuring the lifespan of the roof and the long-term durability of the home. Whether the roof is covered with shingles, shakes, tile or slate, be sure it is protected with Surround™ SR Underlayment. It is water’s toughest opponent, creating a secondary water barrier that reduces the incidence of leaks caused by storm damage, wind-driven rain, ice dams and worn roofing materials. 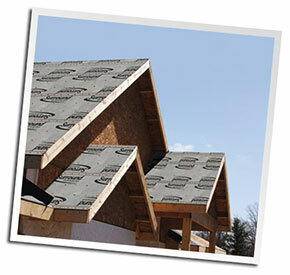 It is a waterproof, synthetic polymer material that will protect your homes against moisture intrusion. 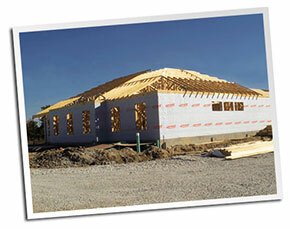 Stronger—10 times stronger than 30-pound asphalt felt for the ultimate tear resistance, so it will not blow off during installation and it helps eliminate the need for costly roof repair. Drier—the unique slip-resistant surface is waterproof to prevent moisture issues. Lighter—up to 10 times lighter than 30-pound asphalt felt so it is easy to carry onto a roof. Faster—in addition to having five times more underlayment per roll than felt, the rolls are also 25 percent wider for quicker roof deck coverage. Surround SR Underlayment meets the more stringent requirements of International Code Council® (ICC) AC48—Acceptance Criteria for Roof Underlayment for Use in Severe Climate Areas. It is one more component in the line of defence against the elements.